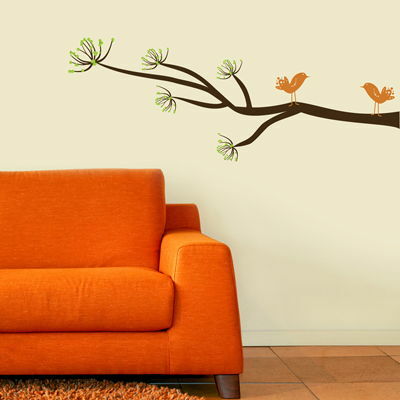 Branch with leaves measures 62 inches wide by 22 inches high, as shown. Two larger Birds (shown) measure 7.5 inches wide by 7.5 inches high. Two smaller Birds (included, but not pictured) measure 5 inches wide by 5 inches high. The branch from our Mod Tree Branch comes in two pieces, and is super easy to apply. The little leaves will come pre-arranged, so you can just place them over the branches! Birds can be applied however you choose. Practice decals are included with every order! STUNNING! housewarming was great, everyone LOVEd the tree!! will send over a pic soon..thank you for such an intricate beautiful piece of art! will order again! thanks! This is AWESOME!!!! it was the perfect touch to my daughters room!! the fairy with the dandelion is so cute and makes it so girly in her room. I'm now looking at something for the living room. your prices are great, the decal was so easy to put up, the shipping was fast and customer service was great. I will be back to order more, I couldnt be more pleased. THANK YOU!!!! I absolutly love the Bless this home decal. It was very easy to put up and completed the look we wanted for our new home. We were able to take several family photos we just took and place them around the decal. Everyone comments on how it looks like someone hand painted it onto our wall. Thank You so much and I look forward to doing business with you in the future.